Etechwork CRG104 is the compatible replacement of the OEM model. It is manufactured with the highest standards of quality, reliability and compatibility. We guarantee our products without defects in materials and workmanship. 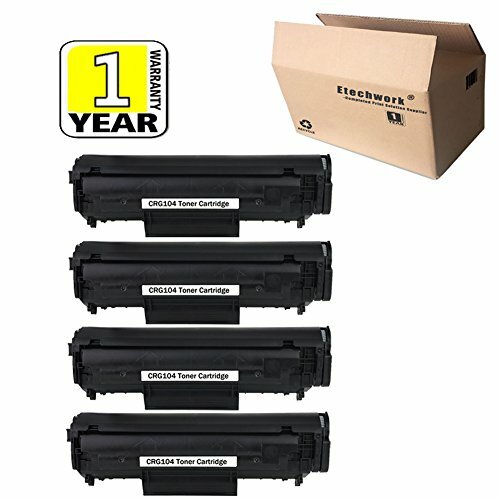 1-Year 100% Quality Guarantee Ensures that you will get quality printouts with our compatible or remanufactured cartridges.If the product is found to have problems under normal circumstance, demand for a return is acceptable. Certification: Meeting standards of ISO 9001&14001, we produce our products with 100% new components. If you have any questions about this product by Etechwork, contact us by completing and submitting the form below. If you are looking for a specif part number, please include it with your message.